If this is your first visit to our website, we hope the following information is of interest to you. Sigma Rifle and Pistol Club was established over fifty five years ago by the present and existing Secretary and Treasurer. We are always looking for new members and are often overwhelmed with enquiries to join us, our recently reintroduced Waiting List has reached the point where we are unable to accept any new Members until the Spring next year. However, in the meantime if you are not already on our Waiting List please declare an interest in joining us via the 'Contact Us' Link. At the very least we will add you to our Waiting List and if necessary assist you in perhaps finding another club to join, although it seems most other clubs also operate a waiting list. The Lease for the Club Range will provide shooting continuity until at least 2036. Club Fees are currently £175 per annum. Club Fees are usually collected by way of two 6-monthly payments; January 1st and 1st July. 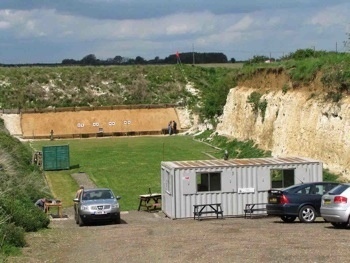 Fees are calculated by sharing the costs of running and maintaining the club amongst its members; Club Fees include:- Associate Membership of the National Rifle Association and the UKPSA which includes up to £10 million Liability Insurance cover; the use of the Club Range and all its facilities 6½ days/week, including targetry, use of club rifles and equipment, heating and hot beverages. There are no "green fees", additional weekly/monthly or per visit payments. However, to keep Club Fees as low as possible it is a condition of membership to volunteer to help out with on-going and periodic essential range maintenance when required. Furthermore, Full Members are allowed to nominate an immediate member of their family for 'membership' at no additional cost. This would only apply where the immediate family member does not have a firearms certificate. For younger Members, i.e. under the age of eighteen, there is a Junior Full Membership category. Whilst this is a sad reflection on modern times, if you are under 18 years of age, you will have to be accompanied by a parent/guardian at all times while attending club functions or fixtures. Due to Home Office rules, applicants applying for membership who do not already have a firearm certificate, will be required to complete a minimum 3 month Probationary Membership period. Full Membership will be based on the safe handling and use of firearms and regular, at least monthly, attendance to the club. When Full Membership has been granted there is a one-off Joining Fee of £50. The Club Range is open 364 days of the year. As the range is mostly used on a Saturday and Wednesday's, Probationary Members will be required to attend the club mainly on a Saturday until they have been granted Full Membership. This will allow Committee Members to ensure that adequate supervision and essential Safety Training is provided and they will be able to 'monitor' the progress and safety abilities of prospective new members. © Sigma Rifle and Pistol Club 2014. All Rights Reserved.